Knicks trailed by 8 in the first quarter against one of the most offensive teams in the league. The Trail Blazers were quite successful in running the pick & roll and dropped 33 points in the first period. The Knicks relied on Derrick Rose‘s penetrations and Carmelo Anthony‘s jump shots. Kyle O’Quinn had his second start as Joakim Noah missed his second straight game, but finished with just 4 points and 5 rebounds in 22 minutes. Brandon Jennings catalyzed the Knicks in the second quarter and tied his season-high 11 assists. His speed and dedication earned him plenty of minutes off the bench and hadn’t been for his cramps, he would’ve played more than 22. But as Derrick Rose returned, his effort down the stretch paid off as the Knicks got the win, 107-103. Rose scored 8 of his total 18 points and sent 4 of his 5 assists in the last quarter. 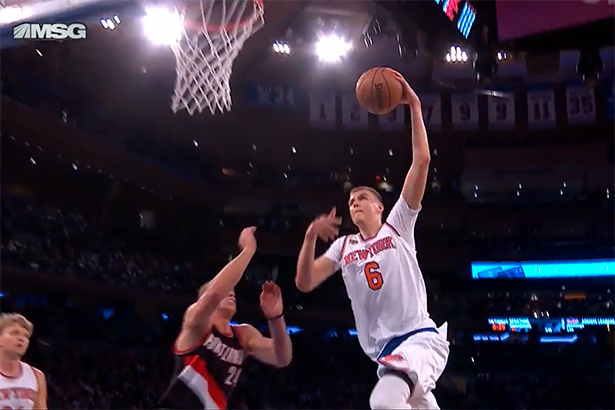 Kristaps Porzingis had another monster night, leading the Knicks with 31 points. The Latvian sophomore added 9 rebounds and scored 3 shots from behind the arc. The highlight-reel happened with 4 minutes to go until halftime, when, after receiving a pass in the right side of the court, he put the ball in his left hand and took Mason Plumlee on a ride that ended with the dunk of the night. This was Porzingis’ second 30+ game and both happened this week. Carmelo Anthony scored all of his 17 points before the start of the fourth quarter but his effort in the last minute gave the Knicks an important possession with 30 seconds left, to help them conceal the victory. However, the nice surprise of the night was Mindaugas Kuzminskas. The Lithuanian rookie scored 5 of his total 10 points in the fourth and his defense was impressive. After averaging just 9 minutes a game, Kuzminskas played 21 minutes and it seems like he’s earned Jeff Hornacek’s trust to make him part of the rotation. The Knicks, 7-7, have won 4 of their last 5 games and will play back-to-back games on Friday and Saturday against the Charlotte Hornets.